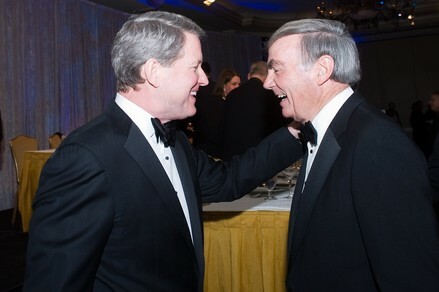 Former Flintoid David Weston makes a funny joke about Sam Donaldson's "hair." Flint Expatriate David Westin resigned as president of ABC News earlier this month. "Westin didn't plan on a career in television news. He spent his childhood in Flint, Mich., the son of a tool-and-die maker at AC Spark Plug," wrote David McKay Wilson in a Michigan Today profile of Westin. "At night his father, Lawrence, earned his bachelor's degree at the University of Michigan's Flint campus, which eventually landed him a job in management at Ford's plastics plant in Saline. The Westins then moved to Ann Arbor, where David attended Pioneer High. "In the summer of 1970—between high school and his freshman year at the University of Michigan—David Westin worked at the Saline Ford plant. He impressed his boss, who urged him to become a plant foreman, which paid $20,000 a year—a princely sum back then. Westin was tempted, but opted instead for college. He began on the Ann Arbor campus as a music major, studying oboe. He lived at home and worked part-time selling shoes to pay his way." WJRT ABC 12 Flint is one of only a small handful of stations owned by ABC/Disney. Jim Bleicher, the news manager, is a friend of mine - and a great guy. Not for long, Shawn, WJRT ABC 12 is up for sale to the stations' former owner, SJL Broadcasting. Something that you should be reporting on here Young. ABC bought WJRT-TV and WTVG Toledo because WXYZ-TV was possibly being sold to a company that was going to drop ABC affiliation. They would probably have moved the transmitter to near Rattallee Lake Rd. and Bridge Lake Rd. near Clarkston, one of two sites originally considered for WJRT-TV when Goodwill Stations first applied for Channel 12 around 1952. Their intercity microwave tower, connecting the WXYZ-TV studios on 10 Mile Rd. in Southfield and the WJRT-TV studios on Lapeer Rd. in Flint, was there until recently. Competing applicants for Channel 12 and Detroit TV stations, fearing competition, forced the transmitter site to be moved to near Chesaning, and delayed the sign on until 1958. At that time, Flint was the largest city in the US without a TV station, to the great benefit of WJBK-TV, WWJ-TV, WXYZ-TV, WJIM-TV, and WNEM-TV. Meanwhile, all references to David Westin being born and growing up in Flint have been removed from various online biographies. Perhaps it looks bad on his resume?